This walkway in Gyokusendo Cave is almost a kilometre long. Okinawa is Japan’s paradise – a sun-soaked land of sandy beaches and coral reefs. But for those wanting a break from the heat and the sunshine, a world even more exotic lies underground. 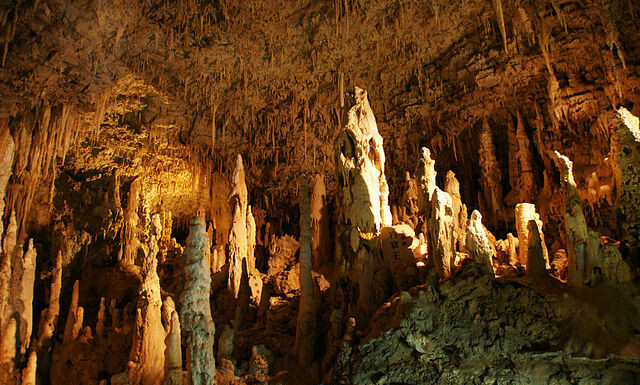 Gyokusendo cave stretches five kilometres from end to end, and boasts a host of spectacular rock formations. It’s been around for 300,000 years or so, but it wasn’t discovered by us humans until 1967. Visitors access the cave via a long flight of stairs, descending into a world that stays at a constant 21°C all year round – often a welcome relief from the heat outside. A steel walkway stretches 890 metres into the cave, twisting and turning around the many bends and ups and downs, and squeezing through some narrow gaps. These turquoise blue pools of water have an aura of mystery. 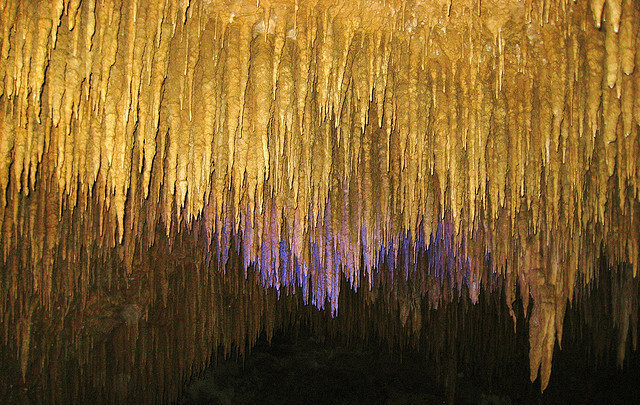 The ceiling of the cave is covered with stalactites, and the floor with stalagmites – there are hundreds of thousands in total, some of them huge. 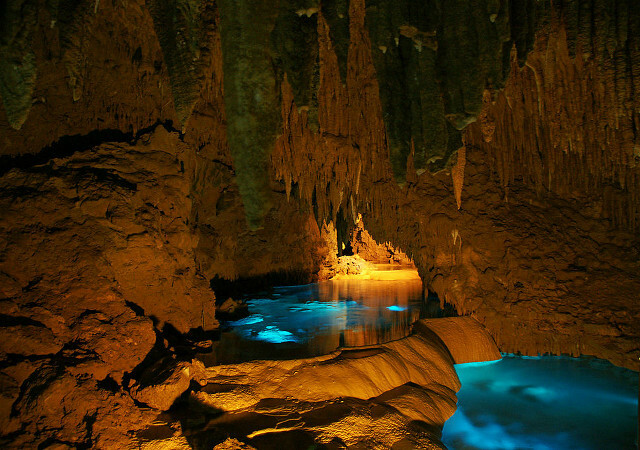 An underground river runs below the walkway, passing over sandbars and down waterfalls. Water constantly drips down from above, very very slowing growing the rock formations in the process, and already new stalagmites are beginning to form on the walkway. The sound of trickling water can be heard everywhere, but otherwise the cave is mainly quiet and peaceful. As you move deeper in, you pass forests of stalagmites and pools of crystal-clear water. Looking down, cave fish can be seen swimming in the river. Lights have been carefully placed to enhance the natural geology, some of them moving, creating multi-coloured psychedelic displays. Finally, on the way out is a special treat – there’s an escalator so you don’t have to walk back up all the stairs you came down. 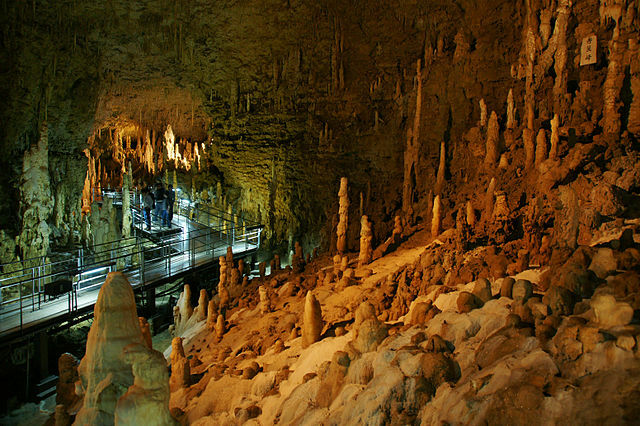 Some estimates put the number of stalactites in Gyokusendo Cave at over a million, but they’re not all as closely packed together as these ones. If that all sounds too tame, every September there are daily tours that take you beyond the walkway, into the parts of the cave that are normally off-limits. You’ll be supplied with a hard hat to keep your head safe, but the rest of you will have to put up with submersion in the river. Parts of the tour involve a fair bit of climbing and scrambling, but as anyone over the age of five is allowed to join in, it’s not really very hard. 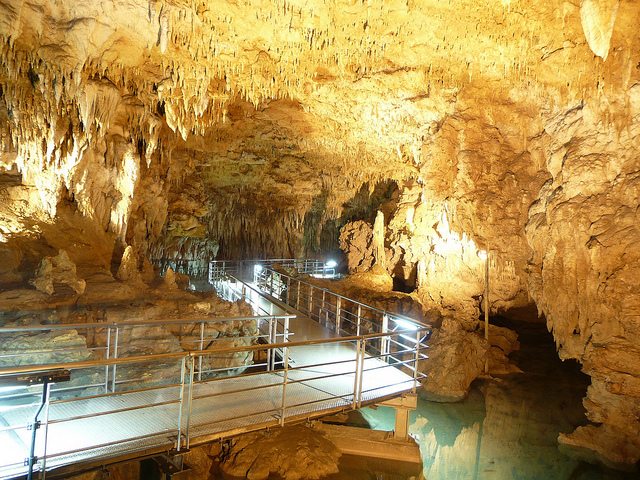 Gyokusendo cave is located underneath the Okinawa World theme park, and is open 9am to 6pm or 6:30pm every day. It’s about 30 minute’s drive from Naha, and buses 51, 54, 81, 82 and 83 stop outside. A trip along the walkway takes around an hour, and costs ¥1,200. The September tours, which must be reserved in advance, take two hours and cost ¥2,000. For more information, see the official website.